Let’s face it: being a woman is hard. Not only are we expected to take on 100 impossible tasks a day, but we’re expected to do it with a full face of makeup, a polished do and five-inch heels. Long gone are the days when only men ruled the corporate office, the stock market floor or the household (Marissa Mayer anyone?). Technology, a little elbow grease and a lot of hard work have contributed to women on top. This week’s Apps on Tap is just for the girls. From YouTube how-to-videos to Pinterest style tips, technology has been helping women look their best, while also keeping their household and lives organized. Ladies, listen up, here are some go-to apps to make your day more fabulous while on the go. How many times have you caught yourself having a “Clueless” moment, when standing amongst a closet full of clothes with nothing to wear? Before maxing out your credit card on new duds, find fashion inspiration using Pose. Pose is the ultimate fashionista app, where users can browse through endless fashion looks posted from trendsetters across the globe. Wondering what trendy shoe goes with the latest printed pant? Similar to other social networking sites like Facebook and Instagram, users can follow friends and over 3,000 fashion bloggers and celebrities to see what trends they are wearing in real-time. The stylish user interface makes browsing easy and users can even post their own “pose” using their smartphones camera feature. Even more, users can save and organize their favorite looks and items in their personal collection and shop looks created by other users. To avoid being overwhelmed, first take the Pose style quiz to give yourself a personalized list of suggested users to follow. Being chic has never been this easy. Instead of stalking the latest fashion magazine, get exclusive access to your favorite trendsetters with Pose. Who knows? Maybe you’ll become the next Rachel Zoe. Who better to trust for the latest nail polish trends than OPI? With celebrities like Lady Gaga and Beyonce showing off new fabulous nail designs almost every day, it’s hard to keep up with what’s hot. All girls can attest to the annoyance of buying expensive nail polish at the store, only to find out that it looks totally different than you imagined (even after four coats of polish). Instead of spending tons of money on colors and manicures, try OPI’s “Try-It-On” studio app. With the app, users can browse through hundreds of OPI lacquers using the apps search tool. Users can search by color, name or browse through OPI’s exclusive collections of shades. Once you find the perfect shade, use the “Try-It-On” studio to see a virtual look at how your favorite shade will look on your nails. The studio has an adjustable skin tone and nail length feature so users can see exactly how the latest nail trends look. See something you like? Users can save their favorite colors or click on the Facebook tab to stay up-to-date on the latest OPI news. With this app at your perfectly manicured fingertips, you won’t have to suffer another nail disappointment. When it comes to good or bad hair days, every day is a guessing game. Hair can be just as unpredictable as men, so us girls need all the help we can get. For years, women have relied on InStyle for the latest fashion and beauty advice. Now with the magazine’s mobile app, InStyle Hairstyle Try-On, women can try the hottest celebrity hairstyles without taking a trip to the salon. How does it work? 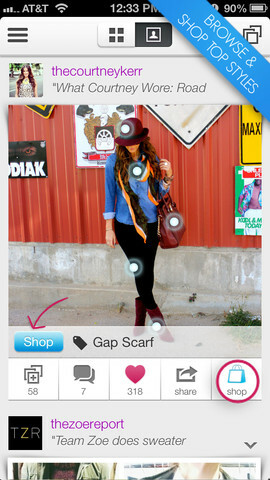 First, users easily upload their own photo to the app. 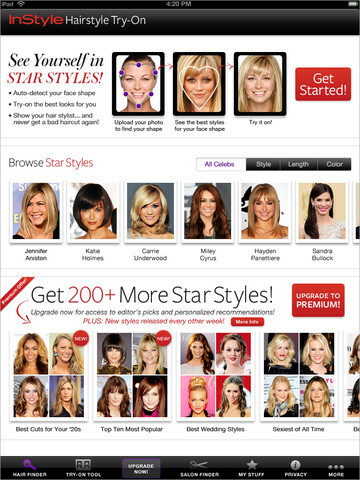 Then, using auto-detect technology, which helps determine a user’s face shape, the app suggests hairstyles from celebrities with similar face shapes. Once your face shape is determined, choose from over 500 styles and cuts to try on. The “Stylebox” feature lets users adjust the placement or length of the style for a more accurate look and feel. Get personalized recommendations and style tips from InStyle editors or browse though their hand-picked style guides like “Best Cuts for Your ‘20s” or “Wedding Hair.” Users can save styles or share suggestions and results with friends. Instead of sitting in front of the mirror for hours imaging how Jennifer Aniston’s famous hairstyle would look like, try the InStyle Hairstyle Try-On app. Being a woman has its perks (free drinks at the bar! ), but being glamorous head to toe takes a lot of work. With these apps, looking and feeling fabulous has never been easier. Just be sure to download The New York Times app as well -- your mind should be equally as fabulous. 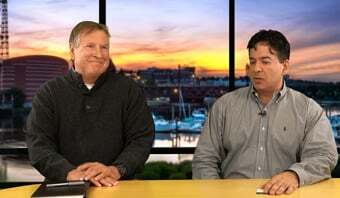 Stayed tuned for next week's Apps on Tap.